This week, Governor Malloy signed a significant bipartisan medical patient consumer protection bill which I co-introduced. Public Act 17-241, An Act Concerning Contracts Between a Pharmacy and a Pharmacy Benefits Manager, the Bidirectional Exchange of Electric Health Records and the Charging of Facility Fees by a Hospital or Health System, will help increase transparency regarding pharmaceutical costs, prevent consumers from paying more for prescription drugs than the drug actually costs and ensure fair competition to benefit consumers. This new law is a continuation of our bipartisan effort and commitment to pass legislation that protects patients in the healthcare system. It will protect patients from price gouging by pharmacy benefits managers and ban gag clauses in contracts that prevent pharmacists from informing patients when lower cost equivalent alternatives are available and when the patient’s copay is higher than the price of the generic medication. It will ensure that drug and medical device manufacturers who violate antitrust laws, by price fixing for example, can be held accountable. And finally, it will require more transparency when it comes to facility fees to ensure that patients are not surprised by fees when they receive medical services. I’d like to thank Senator Fasano and all who participated in the process to craft this bill, provide informed assistance and helped us create strong, sound policies for our state. 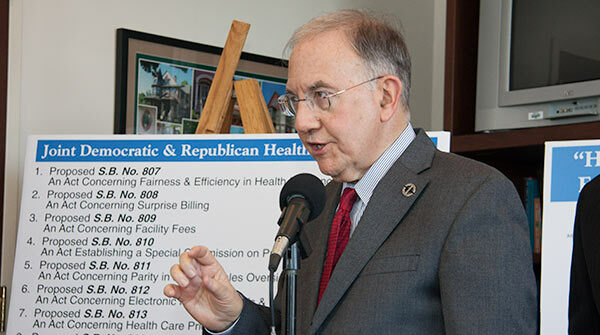 That group includes retail pharmacists, pharmaceutical manufacturers, the AARP, the Universal Health Care Foundation of Connecticut, as well as the PBM industry, representatives of the health plans and representatives of Governor Malloy’s administration. In passing this bill the General Assembly sent a strong message that we believe it is good policy to prohibit secret claw backs that cause consumers to pay more than the actual cost of the drug, as well as other anticompetitive behavior. We also believe such policies should have strong antitrust penalties in them so that violations carry genuine consequences and consumers who have been harmed can be made whole. This is a major accomplishment for our state and reaffirms Connecticut’s role as a leader in establishing thoughtful, compassionate consumer-focused policies in the health care industry.